I am going to start out a little sappy today. I want to say how amazing this community really is. I have become close with so many wonderful women that I have met in so many different ways. I have met people on MUA's Nailboard, I have met people through the blogging community, and most of all through Twitter. I went through a really hard time today, and you girls were there for me when I really needed someone. Thank You! On to fun stuff. I wanted to do a fun mani to cheer me up. And what cheers me up? Glass flecked ChG polishes, of course! The sun peaked out this afternoon, and since I am at home rather than at work I flew into action. I wanted to do a comparison between two polishes that appear quite similar in the bottle. 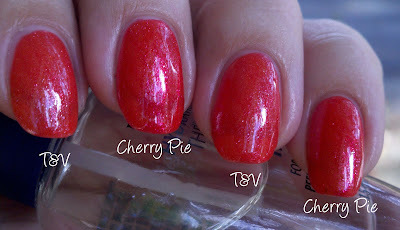 Cherry Pie is from the 2009 Summer Days collection. Tarnished & Varnished is from the much older Martini Pedicure collection, and is not B3F. 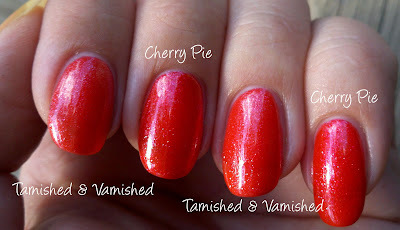 Tarnished & Varnished is definitely the lighter of the two, and Cherry Pie is, well, more cherry! I loved the formula on both of these. 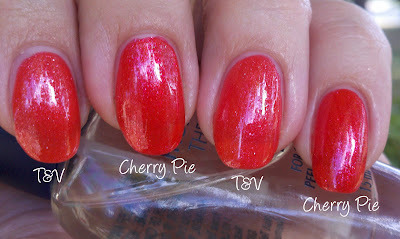 Some of these glass flecked polishes are difficult to work with, but these are not in the least. The casual observer may not be able to tell these apart, but they are definitely not dupes. However, if you are longing for Tarnished & Varnished, I would suggest picking up Cherry Pie to curb your lemming! I got mine on sale at Sally Beauty a few months ago, but you can still find it at e-tailers like VNS.